Embossed and debossed printing are both popular techniques that can create the kind of printed pieces that stand out where many others fall flat. They’re the invites that embody a day of elegance and those eye-catching business cards that you can’t stop running your finger over. 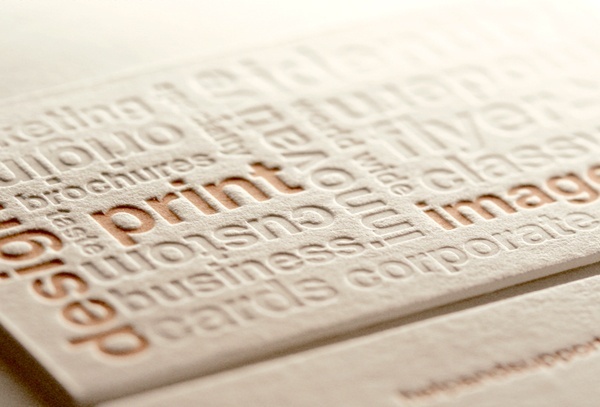 But what is the difference between embossed and debossed printing? And which one suits your needs the most? Embossing is when you press into paper or card stock from underneath. This means the finished design stands out from the paper, giving it more of a 3D effect. Debossing, on the other hand, is when the imprinted design causes depressions in the material leaving a depressed (debossed) imprint of the image on the paper or card stock. The basic technical aspects are pretty much the same. Using heat and pressure, a metal plate containing a design, text or a pattern is pressed into the stock to form a raised or lowered image. There’s no right or wrong answer when it comes to choosing embossed or debossed printing techniques. Both are popular and are great for giving printed pieces a fresh, contemporary feel. At the end of the day, it’s all about what’s best for your project and a matter of personal preference. Embossing uses a die to slightly raise images off the paper or card stock of your print piece. By doing this, it creates a 3D effect which succeeds in bringing emphasis to the area you want your target audience to focus on the most - that’s the part which is embossed. 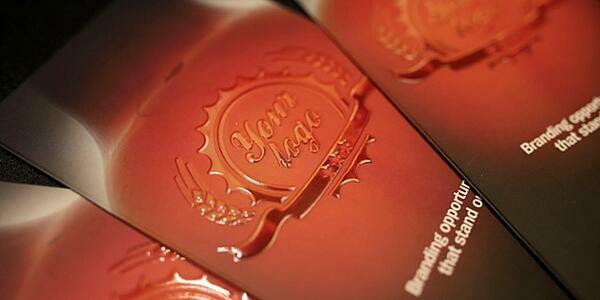 Embossing is made using two dies, a front and back that sandwich the paper to create the 3D effect we mentioned. For the most effective embossed pieces, make sure a detailed die and a heavier paper or card stock have been used so that the depth and detail of the embossed graphics or images are highlighted, as that’s what you’re trying to show off. When finalising your embossed designs, make sure you’re made aware of the back of your print piece. Although the point of it is to make the focus area stand out by raising the image, embossing also affects the back of the print piece. That doesn’t mean your options are limited, it just means you have more freedom to add some eye-catching visuals to the piece that can help make the back stand out as well. Think along the lines of drawing attention to aspects like your logo or contact information, just in a less boring and traditional way. Instead, it helps to make vital information look modern and sleek. Debossing is the complete opposite of everything highlighted above. It’s when an image, logo or text is imprinted into your print piece to create a depressed effect - basically creating an indentation in the stock you use. The metal die is stamped on to the front of the paper or card stock to create that depressed focus area. However, the key difference between the two techniques - other than one being a raised design and the other being indented, is that debossing doesn’t interfere with the other side of your stock. Therefore, it gives you both sides to work with, which isn’t the case with embossing. Not only that, but you can also choose to leave the debossed area untouched or fill it with ink or foil stamping, like the embossed print technique. Regardless of the technique you choose, embossing and debossing can help your print projects stand out in a variety of ways. Consider the following to understand what can be achieved with both. Using embossing or debossing, draw your readers’ eyes to the most information on your products, such as rack cards, brochures, postcards and more. Both techniques can help your company stand out on products like stationery, letterheads, envelopes and even business cards to add that professional touch. The power of touch should never be underestimated in print marketing. Whether it’s embossed or debossed printing, they both add unique textures which feel good in the readers’ hands by providing a captivating effect. It’s something they don’t feel or see every day. By investing more into your print by adding finishing options like embossing and debossing, it communicates a much higher quality and value with your customers. Both embossing and debossing are used for aesthetic purposes. For example, embossing is used from credit cards to Braille books while both techniques are also used in wedding invitations, business cards, stationery, leather and other product packaging. So, they’re not used on just everyday, ordinary products and materials. They’re used to help improve the appeal of the product to potential customers. So, they’re elements you should consider when designing your printed products. Artists in the music industry use these techniques for their CD covers - even in this digital age. It helps to make artists look more established. Cosmetic industries use these methods primarily for their product packaging because it helps the product feel more luxurious and expensive. Here’s an example of a logo we embossed on a leaflet for Beatson Clark. They wanted a way to promote their own label by embossing on bottles to their clients. After originally considering a leaflet, we were able to create an embossed bottle effect in a leaflet which gave their prospects and clients a much more tactile feel of what they would actually receive. This is just one example of what an embossed finish can achieve. The debossed technique can also be used on the examples we highlighted above. Again, it’s a personal preference that depends on your print project as some will benefit a lot more by giving off a concave effect. Both techniques can help turn ordinary stock into a beautiful piece of art. They’re great methods which are suitable for a variety of different applications and can help to convey an unwritten message to your target audience.